The more we understand the four gospels—the distinct narrative and theological emphasis of each evangelist, the unique portrait of Jesus that each presents—the better we come to know Jesus. This knowledge, of course, is much more than an intellectual awareness or knowing about someone. When we enter into the gospels, we come to truly know Jesus the Christ in an intimate way. Through this volume readers will become familiar with the world in which Jesus lived, the cultural customs, the important geographic locations, the biblical terms familiar to first-century Christians but foreign to a contemporary audience. In addition to charts, maps, and photos, this study of the gospels provides an excellent Catholic perspective, answering such questions as: How is the Bible used in the liturgy? What is the connection between the gospels and Catholic social teaching? The Four Gospels lends itself to both quick reference and more in-depth study or meditation. Whether you turn to the volume for personal use or as part of a formal study, you will appreciate the gospels more deeply—and know Jesus more intimately. Here is a marvelous Catholic resource for study of the Four Gospels. Drawing on the teaching experience of the acclaimed Little Rock Scripture Study program, it offers the full gospel texts of the New American Bible and its informative footnotes-but wonderfully augmented with helpful introductions to each gospel, multiple links to relevant Catholic doctrine, liturgy, and practice, and sidebars embedded in the text to help explain difficult passages. Study groups, pastoral staffs, and individual readers wanting to explore the Gospels will welcome this fine new guide. This study edition of the gospels will be a great resource for both youth ministry (high school) and adult bible study groups. Catholic Biblical scholarship at its best is represented here. Its wonderful layout with charts, maps, photographs and side-bar comments provide a rich context for understanding the world of the gospels. A long essay on the Bible in the Sunday Liturgy answers the questions that many adults have about what they hear at Mass every Sunday. `Getting It Right' sections explain complicated topics. The presentation overcomes the `too hard to read' appearance of most Bibles. Little Rock Scripture Study has a well-deserved reputation for making the Scriptures more accessible to adult Catholics. The Four Gospels: Catholic Personal Study Edition continues this tradition. The materials that supplement the NAB translation provide helpful cultural and historical background. They make important connections to the liturgy, personal prayer, and Social Justice Teachings without detracting from the sacred texts they illuminate. What a gift! I highly recommend it to those interested in having a fuller understanding of the four gospels for they will not be disappointed. 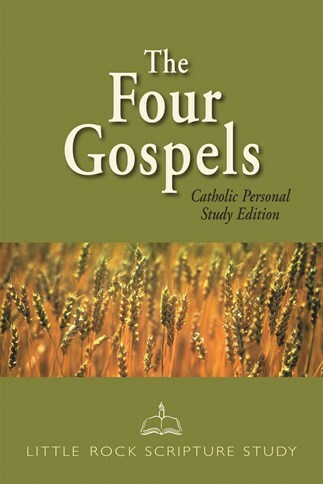 The Four Gospels is an insightful aid, providing helpful assistance for Catholics as they become ever more dedicated to frequent Bible reading and deeper levels of study. The clear and pertinent information, answering common questions in explanatory boxes, are particularly helpful for the inquisitive Bible student. As a long-time Scripture teacher at the diocesan and parish level, I have never been so impressed with a resource for studying and teaching the Gospels as The Four Gospels. The format, content, and explanations are invaluable for both an instructor with an extensive background in biblical studies as well as for students with only a `weekend at Mass' exposure. In particular, the footnotes and side boxes are of great value in helping the reader understand the content and context of the Gospels. This is a wonderful guide to the Gospels. The attractive layout and beautiful graphics make the search into the Scriptures very inviting. The pages are chockfull of information, and the interpretation is always guided by the best in Catholic biblical scholarship. With this study edition in hand, it is a very short step from Bible reading to prayer.